I often find it funny that someone you don’t know wants to give you food. What I mean by that is I have a friend in the family whose brother loves to hunt and fish. With that said he often times asks his brother if Dax would like some pheasant, or in this other case last week, some turkey breast from a recent kill. You know what my answer is going to be right? Right. Me too. I always agree not only because I might not have ever cooked pheasant or really had a fresh turkey breast, but I will never pass up that generosity. When I first hear turkey breast I immediately thought of jerky. I’m not sure why, but I did. Probably because I wanted to smoke some food, and more importantly my kids love jerky. While I have made beef jerky in the past, I knew that turkey could take on some of those same flavors, but was probably a bit more delicate of a meat, so I decided to adjust my marinade a bit to accommodate for that. Begin by cleaning your turkey breast. Remove any silver skin and any strange stuff. Cut the breast into your desired thickness. I went with about 1/2 inch slices. To a mixing bowl, add everything but the sliced turkey breast. Mix well. Add in the sliced turkey breasts, cover, and refrigerate overnight. The following day, prepare your smoker. I chose the smoker because I wanted a smoke flavor. Please keep this in mind that you can use your oven as well. I actually went both ways on this one. I used my smoker to blast the smoke and dry it out a bit, then set the jerky in the oven, on the oven rack, on 170 degrees for the remaining time. Once your coals are all set (yes, you can use a gas grill with your smoker tin), add in the the soaked mesquite. Drain the turkey marinade, and then set the strips onto your grates on the smoker. The chips will begin to heat up and begin pillowing up within your smoker. Let this smoke for about 1 hour. Remove from the smoker and onto your oven rack at 170 degrees for another 3 to 4 hours. Check on the jerky from time to time to make sure it does not overcook. 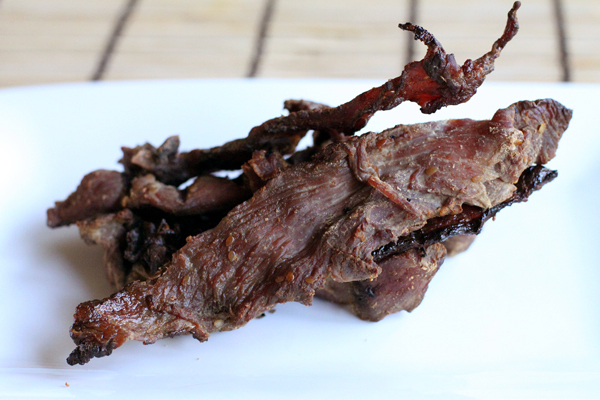 When the jerky is fully cooked, remove it from the oven, and let it cool on a plate. You can store this jerky in an airtight container for a week or so, but my guess is that it will not last that long. My kids loved it, I loved it, and my coworkers thought it was some of the best turkey jerky they have had in quiet some time. They are all critics, so it was probably great. I vacuum sealed the rest of the turkey jerky and had that package sent back to the proud owner and contributor. Hopefully he enjoys it just the same. Thanks for the article. Just a question. If I do use a gas grill for the 1st hour, should I be at low, med or high temp? 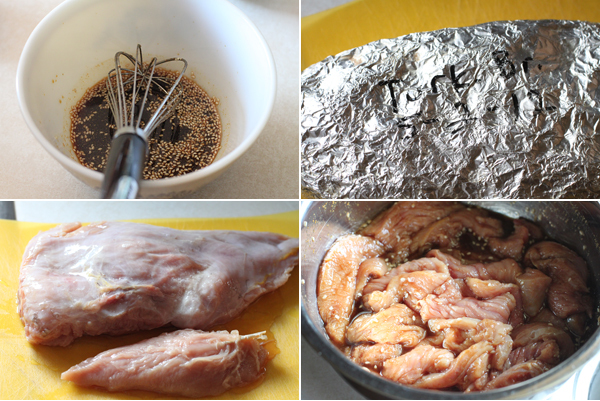 Have you tried Turkey Jerky without brining using a rub?